"Roo!" The voice of my trainer reaches my ears, and I peer out of the trailer. I find that Sharon is striding towards me, her eyebrows knitted together, as always. "Where have you been? Ten minutes, that's all. Get ready." I blink back at her. "What? No, I've half an hour." "Ruby-Rae Woodson." Sharon's lip wobbles. "This is no time to mess around. Get Welly ready, or you'll be disqualified." "You've got to be kidding." I gasp, and glance at my watch. "No, look. Half and hour." Sharon held up her watch. "Ten minutes. Now." She turns on her heels and disappears into the crowds, and I'm left standing in shock. Trust me to get the time wrong. I untie Welly as fast as possible, the bay gelding nudging my arm as I work. "Quit it, Welly." I mumble. "Unless you want to be on the receiving end of Sharon's wrath, you had better behave." It's the first day of the Regional Championships, a well-known event that allows you to compete in individual and team events - Dressage, Cross Country and Showjumping. Today is the first day of the Individual Qualifiers Dressage. My stomach squirms with butterflies as I lead Welly to a mounting block and swing my leg over his back. Now I can see the valleys and hills, and every other rider and horse. My eyes find the warm-up arena, a sectioned off grass area, and I nudge Welly in that direction. Welly is short for Wellington, my dark bay Thoroughbred gelding. When I say "my" I really mean that he's borrowed. In truth, he's the stable's horse, and I'm only there to ride him and represent the area. He tosses his head as we near the arena and I spot Sharon, leaning over the arena fence and gesturing for me to enter. So we do. Welly lengthens his strides and I take the light warm-up session to get a better look at my competition. I hardly know anyone, but there are two faces that jump out at me immediately; Natasha Prescott and A.J Myers. Both extremely well-known riders, who constantly compete against each other for the title as Regional Champion. Natasha rides a dark grey Warmblood known as Cyclone, as wild as his name suggests. He jogs on the spot and tries to get a hold of the bit, but Natasha expertly stays in control. 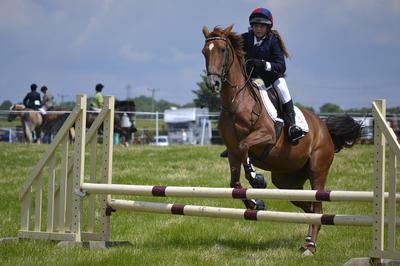 A.J rides a bright chestnut mare known as Charm. They are known to ride a storm in the Dressage arena. Now I'm extremely nervous. If I'm up against both A.J and Natasha, I'll have to play tough and up my game. I see that Sharon is watching me closely, so I transition to trot and post steadily. I want to make a good impression. I'm not going to be the quiet, red-faced girl who weirdly watches the other riders and makes a fool of herself. No, I will show them that I am just as good as the others. You write like it's so real! Write MORE! Please write more! I really like it! First, I love the title. And the story drew me right in. It's VERY well-written. I truly can't wait to read more, so I hope you'll share Part II soon!